STEP TWO in Preparing Mentally for Having Your First Baby: Know yourself and listen to baby to work out what works best. Congratulations, baby has arrived! Have a breather and a few minutes to yourself if you need them and then, when you and baby are ready, try to get him on the breast. It’s a wonderfully bonding thing if you can manage it. Don’t worry if he finds it difficult, though, he’s got a lot going on! Also, it’s worth considering that it may not happen for you. No matter how many times we read ‘breast is best’, the fact is breastfeeding doesn’t work for everyone. If you are one of these women do not feel guilty about it. Preparing mentally for the possibility of this helps enormously. Look at the thousands of children running around who were brought up on formula milk and are thriving! Enough of that for now, however, feeding is the topic of my next blog. So, baby has just been born and until now, he has had everything done for him: oxygen and nutrition on tap via the umbilical cord, and 24/7 comfort and warmth in your belly. Suddenly, he has to breath by himself, feed himself and when you are not next to him, he misses your smell and your warmth. Remember he is an external foetus for the first three months of his life. There is no thought process. He’s just surviving and you are all that is familiar to him. He does not even realise that he is his own person separate from you until he is about 6 months old. When I realised all of this, it made me a lot more relaxed, and gave me a lot more patience with the first few days and weeks of my first son’s life. And most importantly, I knew that we were learning together. I hope it’ll be the same for you, because the more relaxed you are, the more relaxed he will be. Prepare for the feeling of not knowing what you are doing or where to start! Don’t expect too much from yourself on day one and let you and your baby learn together. Neither of you know what to expect on day one, and that’s ok. Twenty years ago or more, if you didn’t have an experienced friend, maternity nurse or family member nearby, you had very little access to knowledge, so you had to rely on your instincts. What you must believe is that the best mother and carer for your baby is you. Don’t worry that you don’t have the experience. Sure it gives you the confidence that you know what you are doing, but if you mentally prepare to embark on this journey, listening to your baby and learning what he is communicating to you and when, you will learn so fast, that very soon you’ll be full of confidence. Experience gives you the knowledge of little things which you pick up along the way and do help, but remember every baby is different, so even the most experienced mother has to get to know a newborn from scratch. What I’m trying to say is, have the confidence to go with your instincts and know what is right for you and your baby. If you have had a natural birth and both you and baby are healthy and well, all you have to worry about is making sure your baby feeds (breast or formula), sleeps and is clean. If your baby finds it difficult to feed or sleep, then help is at hand, and I’ll talk more about that in future blogs, but remember everyone was inexperienced once and they just learned on the job, like you will. Do what works for you and your baby, and if it doesn’t suit you, change it. We are all different, so what worked for me, may not work for you. I have never enjoyed rigid structure, and so a strict routine did not work for me. However, it does work for a lot of people. What’s important is you really think about the kind of person you are before you have the baby, rather than just listening to your friends. It’s not about them. It’s about you and your baby. Also, if you think one way will suit you and it doesn’t, change it. Just like your birth plan, it doesn’t always work out as you expect! Everyone suggested a strict routine to me when I was pregnant with my first. I tried it and after two weeks I knew it wasn’t for me. I listened to people’s advice and thought this was the way it had to be in order to be the best mum I could be. When baby obviously wasn’t happy, I found it incredibly stressful. I doubted myself. I thought other experienced mothers should know more than me, as I was so new to all of this! However, baby and I were not happy, so I ditched the routine. The moment I changed to feeding on demand and carrying my baby everywhere, with no strict sleep times, both of us couldn’t have been happier. The amount of women I know who battle with routine or a particular way of doing things, which doesn’t suit them or their baby, resulting in a baby who cries a lot, breaks my heart. Just as every adult is different, with a different personality, so it stands to reason that every baby will be different. Just like adults, though, every baby likes to sleep and eat and be clean, we just all do it in slightly different ways. Your job as mum is to find out which way suits you and your baby best. Sure there are little tips to help you sooth him, which people pick up along the way, but in my experience (and I can only talk about what I did), if you replicate the environment of the womb you’re more than half way there. Replicating the environment of the womb soothes and calms your baby. So what is the womb like? It’s cosy, which is why swaddling works for many babies (my first loved it, but my second hated being restricted from day one and screamed if I swaddled him). It’s dark, so don’t worry about your baby being afraid of the dark (this is something they learn with the help of TV and older kids!). It’s very, very noisy, which is why people encourage the use of white noise to help babies sleep, or a loud ‘shhhing’ sound. If you want to know more, check out Dr. Harvey Karp’s book, ‘The Happiest Baby on the Block’. He is able to sooth any baby by using what he calls the 5 “S’s”. These include swaddling (replicating the tight space of the womb), swinging (replicating the movement baby felt while in the womb), and shhhing (replicating the noise in the womb). Harvey Karp says that the inside of the womb sounds like 3 vacuum cleaners going off at the same time. He has gathered a lot of his insight from the ¡Kung Sun (or African bushmen) whose babies are incredibly content. As Harvey Karp puts it, “it’s not that they never cry – it’s that they never CRY!” How do they achieve this: they hold their babies 24 hours a day (in arms and in slings), feed their babies on demand, and usually respond to their babies’ cries within seconds . Having also read ‘The Continuum Concept’ by Jean Liedloff this all made perfect sense to me. Her book’s sub-heading is ‘In Search of Happiness Lost’, as she believes that modern society has introduced ways of child-rearing which have broken some of the essential bonds between mother and baby which the 24 hour ‘in-arms’ way of child-rearing seals. Both books are very interesting reads, but I understand these methods are not for everyone. 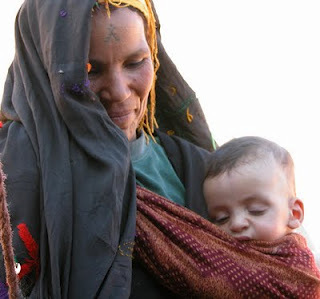 What both have in common, however, is they write about how women in the developing world have very contented babies who do not suffer from colic, and I think there is a lot to be said for that. Modern day society is not the same as living in a rain forest, and so obviously certain things that work there, do not work here. However, there are ways in which we can make baby feel ‘at home’ while being more aware of his needs, responding quickly to them, and you don’t have to be tied to the house, either! 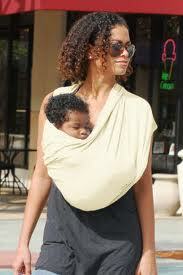 Slings help enable you to be active while carrying your baby and enhance the bond between you and baby. I love slings! Many women want to be active but also want to have their babies on them. If this is you, consider using one. 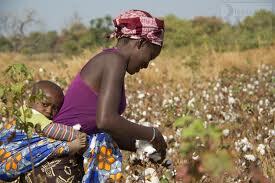 Millions of women round the world carry their babies in this way and have done since anyone can remember. There is nothing new about sling wearing. 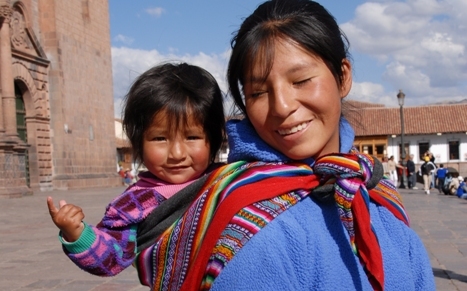 In many cultures it’s been tried and tested for generations, carrying their babies while they work or complete every day tasks; and the verdict is unanimous: it works! I bought all of my slings from Maverick Baby. They try out a lot of the slings on the market, distribute the best ones, and offer personal consultations to help you get to grips with wearing them. This is incredibly important as there is a real knack with sling wearing, which until you fathom it, makes them seem unbelievably complicated. They are not, but you do have to invest the time to get to grips with them. What the sling has over other carrying contraptions, is the way they distribute baby’s weight over your shoulders and across your back, so that you don’t get sore, can carry your baby for much longer periods of time and until they are much heavier. If you have two babies quite close together, carrying your newborn means you don’t have to worry about double prams. I only learned about them in time for my second baby and they transformed my experience in every way. Good luck in finding the way which works for you and your baby. I wish I had thought a little bit more about it before my first baby was born. You can! ‘The Happiest Baby on the Block’, Dr. Harvey Karp, M.D. (Bantam Trade Paperback, 2002), p.84. Jean had spent time in Venezuela in the upper Caura River basin, near the Brazilian boarder, in what was known as the “impenetrable” rain forest, with the Yequana and Sanema tribes. I started off with a ring sling, which meant baby could lie in a foetal position while I did household chores, played with my other son, walked the dog, you name it. When baby was a bit bigger we moved onto the wrap, which I still use today (he is 10 months old!). I have to admit it took me a while to be able to feed on the run, because baby needed help latching on and staying on my breast for weeks and weeks. Once we cracked that, however, it meant no matter where I was, or what I was doing, if baby was hungry, a slight readjustment of the wrap and he was feeding and happy again. Can we see a photo of baby and you in a sling please? Hi Michael, thanks for your interest in the slings. 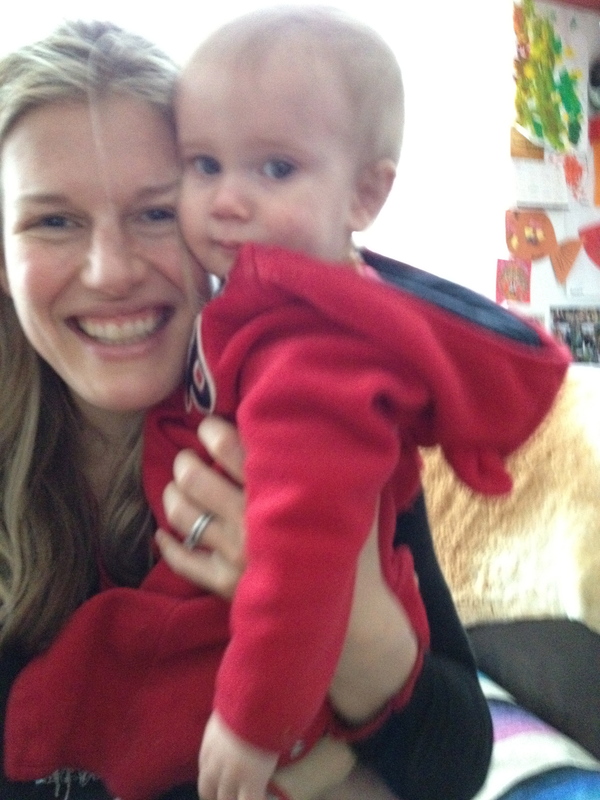 I have published a new post with several pictures of me wearing slings with baby. I hope they and the comments are helpful. I look forward to anything more you’d like to share. Take care and thank you for reading!